Ralph Shaw’s passion for the outdoors was paralleled by an enthusiasm for sharing his knowledge with future generations. Local hunter, fisher, conservationist, and author Ralph Shaw once said, “The role of the successful fisherman and hunter is to share the produce. That’s a very critical aspect. It’s not just sharing the catch, it’s sharing the knowledge and techniques, getting young people and other people involved.” Well known for his weekly column in the Comox Valley Record, Shaw was a nature lover, a life-long learner, and a custodian of the environment. He also wrote for numerous outdoor magazines including The Island Fisherman and The Island Angler magazines, a pursuit that garnered him several awards. But it was his tireless dedication to environmental conservation and animal welfare, and his willingness to pass his knowledge on to others, that many will remember him for. Shaw was born on June 20, 1926 in Ardmore, AB. His family trapped and fished for a living, where Shaw discovered his affinity for outdoor skills. He fished and hunted with his brothers from a young age, and when he was 13, Shaw’s family moved to trout country, where his career as a master fly fisher began. Shaw’s father tutored his children on the importance of fish and wildlife conservation practices. Shaw completed his studies and became a teacher and then principal in Kamloops, which lead to him receiving the prestigious Order of Canada award in 1984 for his work helping establish the McQueen Lake Environmental Centre, 16 kilometres north of Kamloops (today this facility is owned by the Kamloops-Thompson school district and is used for class field trips). He worked for the Simon Fraser University Summer Institute at McQueen Lake, specializing in wilderness survival and outdoor skills. During the 60s and 70s he spoke throughout North America about conservation and outdoor education. Shaw was involved in the BC Wildlife Federation, receiving the Ted Barsby Award as Conservationist of the Year in 1984, and the President’s Awards for his work on saltwater fisheries in 1990. 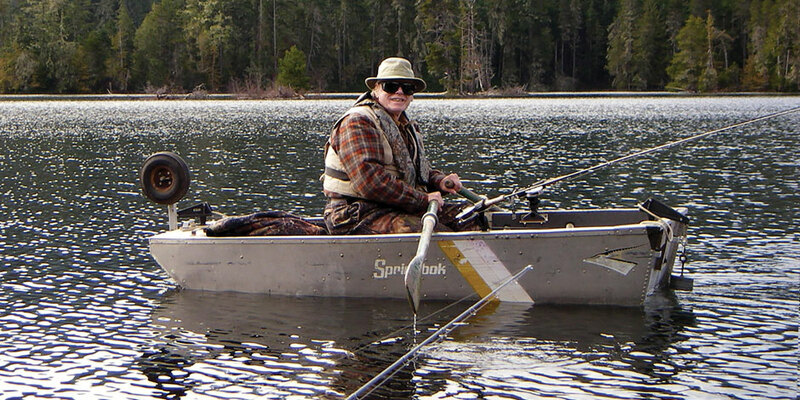 In 1998, he was appointed to the BC Sport Fishing Hall of Fame. In 2007, the BC Lieutenant-Governor invited him to a reception in Victoria to celebrate the 35th anniversary of the Nature Trust of BC, a group he was pivotal in creating. Shaw contributed chapters to several books, and his column with the Comox Valley Record captivated readers with practical advice, insights, and anecdotes. He covered a range of topics including Comox Valley events, local wildlife, and climate change. He also wrote about his delight in sharing the outdoors with his family, and fishing with his grandchildren. Shaw passed away on January 7th, 2016, leaving behind his vast knowledge, a deep appreciation for the environment and its inhabitants, and an everlasting encouragement for the next generation to get involved with the splendours of nature.